In recent years, elephant poaching has reached record levels across Africa. The killings exceed their reproductive replacement rate, putting Africa’s wild elephants at risk of local extinction.6 And the LRA is not the only group benefiting from the exploding demand for ivory from elephant tusks. A number of armed groups participate in elephant poaching across the region. As a consequence, the United Nations estimates that there may have already been a 50 percent to 90 percent decrease in the elephant populations of the CAR and DRC. Park rangers in Garamba suspect that members of the Congolese, South Sudanese, Sudanese, and Ugandan armed forces, as well as state-sponsored militias including the Janjaweed from Darfur, are participating in killing the park’s elephants at an accelerating pace. 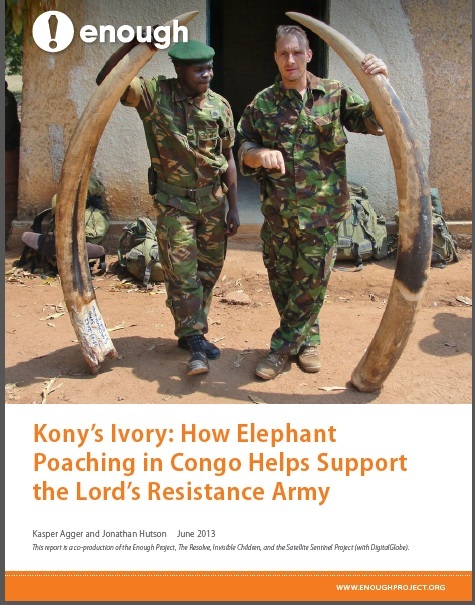 The LRA’s involvement in the trade is particularly troubling since the resources it gains from ivory supports its continuing violence, undermining the international community’s efforts to dismantle the group. There are steps that can be taken to address LRA elephant poaching and hasten the demise of the group. Greater support and more sophisticated equipment would enable park rangers to track and combat the LRA and the other highly organized, heavily armed poachers in Garamba. Real-time intelligence sharing, coupled with increased airborne reconnaissance and satellite surveillance, could help rangers, special forces from the African Union Regional Task Force, or AU-RTF, and U.S. military advisors in their fight against poachers and the LRA. In addition, increased capacity to gather and share reports from the ground, combined with geospatial information, could improve ongoing efforts to predict the LRA’s likely future movements and behaviors. The Economic Community of Central African States, or ECCAS, recently endorsed a $2.3 million emergency initiative to combat the elephant-poaching epidemic in the region. The planned 1,000 civilian police and military forces will engage in joint operations to protect the area’s remaining savannah elephants. If its member states can adequately equip and support the forces, the ECCAS aspires to establish a joint military command and use aerial support, land vehicles, satellite phones, and real-time information analysis systems to track and stop poaching in the region. U.S. advisors have significantly increased the capacity of the African forces opposing the LRA. Ensuring that those forces can operate in and around Garamba with U.S. assistance could lessen the group’s use of the area as a safe haven and a source of material support. It is essential for donors and governments to support a comprehensive effort to stop groups that commit mass atrocities with impunity, such as the LRA, from supporting their crimes by killing elephants and smuggling tusks. The work to restrict the ivory trade by targeting poachers must be accompanied by initiatives focused on making the countries in the region a less hospitable environment for the LRA and the other armed groups that profit from governance, livelihood, and security vacuums. Curbing demand is just as important. Governments, donors, and nongovernmental organizations should continue to pursue strategies to reduce the demand for ivory and isolate countries that trade tusks.